Monkey remittance business preys on unwitting OFWs? Ginamit si Inday? And since when did Atty. 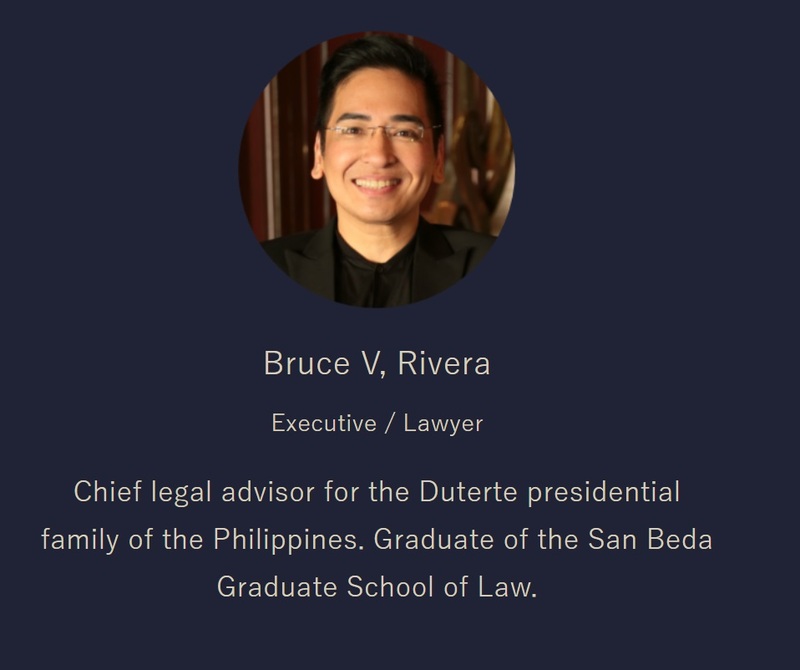 Bruce Rivera become the "chief legal advisor for the Duterte presidential family"? Cryptocurrencies, in simple terms, are digital currencies that are free from control by any single central bank. I will not go into the details of how cryptocurrencies work. The most popular cryptocurrency right now is Bitcoin. Aside from Bitcoin there are other cryptocurrencies that are gaining wide acceptance. With that said, this article focuses specifically on “Noah Coin” (also called “Noakoin”), a cryptocurrency that, according to its website, will be launched on 12 June 2018. NOTE: JPY 3 trillion is roughly equal to US$26 billion using current exchange rates. We clearly see that Noah Coin’s main market is the OFW population, and that its primary purpose is for overseas remittance. 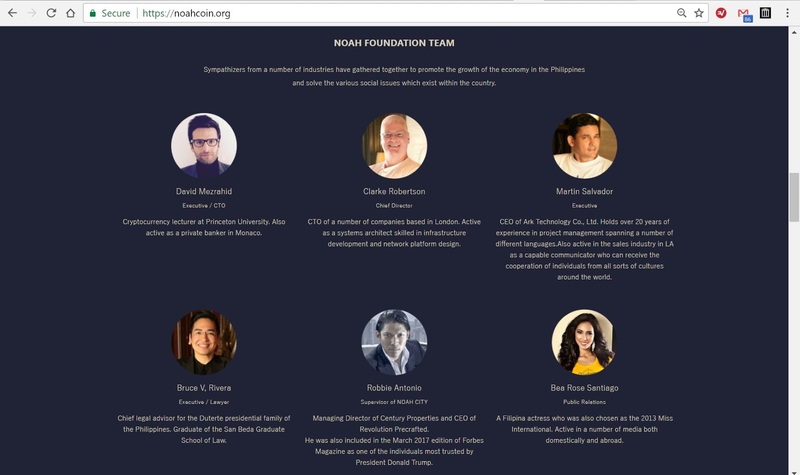 According to the same site, Noah Coin is a project of the Philippines-based Noah Foundation, and that part of the earnings from Noah Coin transaction fees will be used to fund Noah Foundation’s charitable work. Sounds like a good idea! After all, an impoverished country like the Philippines can benefit from another charitable foundation on its shores. 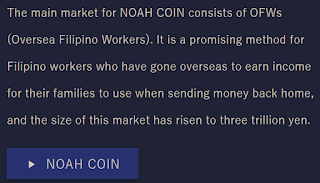 Noah Foundation’s Noah Coins is, for the most part, a low-cost remittance service that mainly targets OFWs. And just like any other newly-introduced remittance service, I felt it proper to check the reputation of the people behind it. A screenshot of "Noah Foundation Team". 4. Executive Martin Salvador, “CEO of Ark Technology Co., Ltd. Holds over 20 years of experience in project management spanning a number of different languages. 5. Robbie Antonio, Supervisor of NOAH City, currently the managing Director of Century Properties and CEO of Revolution Precrafted. Okay, hold on one second! Admitted to the bar in May 2006 [Chan-Robles], Cebu native Rivera is best known for defending, defended businesswoman and alleged pork barrel scam mastermind Janet Lim-Napoles [Inq]. With that said and as a political blogger who has been monitoring the Philippine government since 2015, I know for myself that Bruce Rivera is not the chief legal advisor of the “Duterte presidential family”.For one, Atty. Salvador Panelo is still the Presidential Legal Counsel, and I have yet to learn of a single court case where Rivera represented any member of Duterte’s immediate family. Something’s off. Let’s check another one. "Chief legal advisor for the Duterte presidential family of the Philippines"
A google search using “Mezrahid Princeton university” does not show entries that definitively say that Noah Foundation CEO David Mezrahid indeed works for the illustrious Princeton University. Moreover, a look at the work history in his [LinkedIn] account shows that he’s been based in either Western Europe and HongKong but never in the United States. Princeton is in New Jersey, United States. Century Property’s Robbie Antonio’s [Linkedin] account doesn’t include anything about Noah Foundation, and I sincerely doubt that he’d involve himself in the field of cryptocurrency for the simple reason that he’s a lot better at doing other things. “Executive” Martin Salvador, which Noah claims to have over 20 years of experience in project management, turns out to have been a K-12 teacher in the United States from 2001 to 2012[Linkedin], so where did those “20 years” come from? Meanwhile, I cannot seem to find anything about “Chief director” Clarke Robertson, which the site claims to be a CTO (chief technology officer) of several London-based companies. And lastly, Miss International 2013 Bea Rose Santiago, supposedly Noah’s PR head… do I even have to explain this? 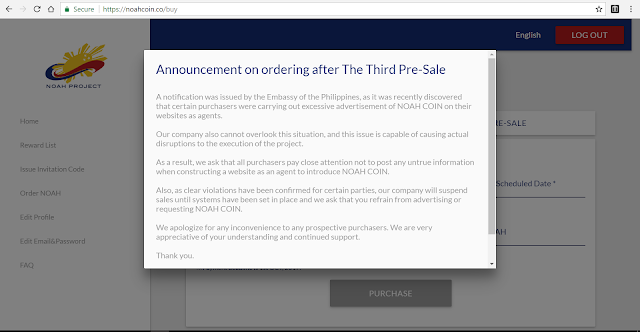 So far, I have shown that Noah Coin’s website appears to be fraudulent. Unfortunately, it appears that some OFWs may have been defrauded as the Philippine Embassy in Tokyo’s warned everyone in March 2017 against both purchasing Noah Coins and engaging with Noah Foundation. “BSP… has not issued authorization to The Noah Foundation and/or Noah Global Innovation Services Inc. (Noah Global) to engage in the pre-selling of Noah Coins nor recognize that Noah Coin is a national project,” the embassy said. Moreover, the embassy said Noah can’t be found in its registered address in the Net Lima building in Bonifacio Global City, Taguig. According to Noah’s website, however, the company is located in Unit 3106 Trade and Financial Tower at 32nd St., Bonifacio Global City, Taguig. The Noah website earlier claimed that one of its sponsors is Filipino-Chinese business tycoon Lucio Tan of the LT group. 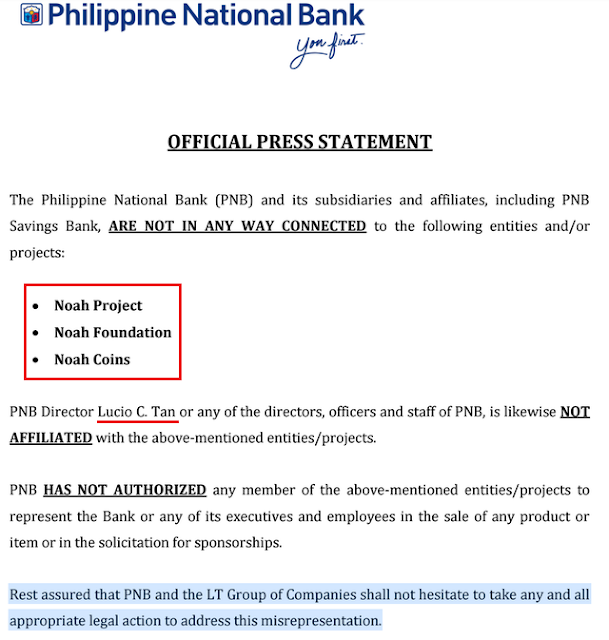 However, in an official press statement issued earlier this year, the Philippine National Bank said it or any of its affiliates are not connected with the Noah Project, Noah Coins, and Noah Foundation. Something’s really off here, especially since I also discovered a similarly-named cryptocurrency, the NOAHcoin. Launched in 2014, NOAHcoin is totally different from the Noah Coin discussed in this article, which has yet to be launched. 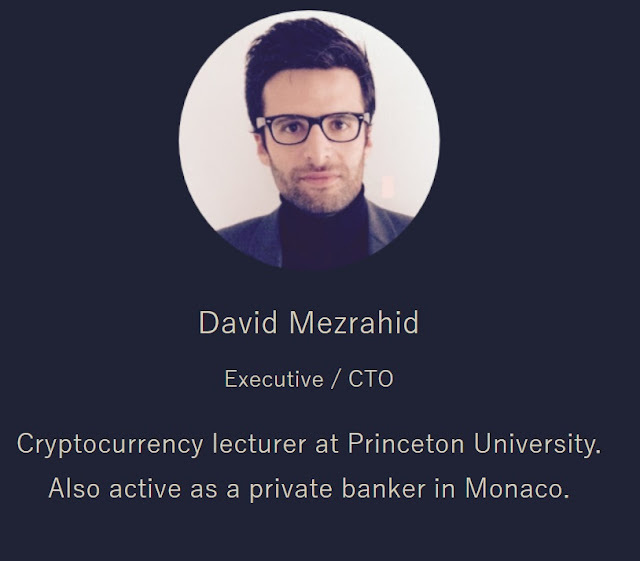 In the relatively small world of cryptocurrencies, why would someone use a name that has been used before and the name of a failed cryptocurrency at that? Yes, all signs, so far, point to fraud. 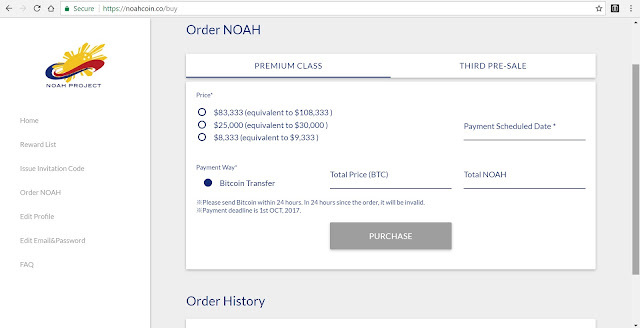 I tried to see how Noah Coins work by clicking on the “Buy” button at noahcoin.org. This led me to “noahcoin.co”, the Noah Coin payment portal. After registering and logging in, I clicked on “Order NOAH”, which is presumably that which will allow me to buy some coins. This is confusing. A currency’s value depends heavily on how widely it is recognized, so advertising is key to its success. Why would Noah dissuade people from talking about the currency? I closed the popup and I was sent straight to the payment screen. From there, I saw that the lowest amount that I can buy is US$ 8333.33, with a promise that it will be worth US$ 9,333.33, presumably by the time Noah Coins are launched on 12 June 2018. There are two other options: $25,000 and $83,333. Wow, that's a lot of money required! Of course, it’s one thing to require an “entry amount” of over $8,333 (Php 420,000) but it’s another thing for people to actually give Noah that money. However, a look at “Issue Invitation Code” page shows that a payment is necessary for a Noah user to earn bonuses for inviting other people into the system. Adding the fact that Noah discourages “excessive advertisement”, what we see here is a classic sign of a multi-level marketing (pyramiding) scheme, where people are required to pay an amount upfront before they are allowed to “sell” products to others. In short, the Noah Project is a pyramiding scheme that disguises itself as a remittance service, especially since it also has a “rewards” page that is atypical of labels in cryptocurrency portfolio management platforms. To make matters worse, the FAQ page explicitly states that Noah DOES NOT issue receipts. Yes, Noah expects people to shell out hundreds of thousands of pesos without proof of payment. The fact that payments can only be made through bitcoins makes the transactions even more untraceable. It appears that this whole thing was started by a Japanese national. Based on his Facebook post, Izumi Tadashi is the one who started the entire Noah thing: the foundation, the project, and the coins. Noah coin is doing very well and the project is progressing. I am really looking forward to the exchange in June 2018. Please wait for the official announcement from the Noah foundation about the start time of the third term presale. Receipt Date: 06 January 2017, a month after Tadashi's post. At this point, I have reason to believe that Tadashi is the "power behind the throne"... but how about the others? Did the website use the identities of the six people without them knowing? Or are the six actually in on it? NOTE: Francis Manalo Santos has already left the group. Rivera wasn’t clear about what foundation it was. 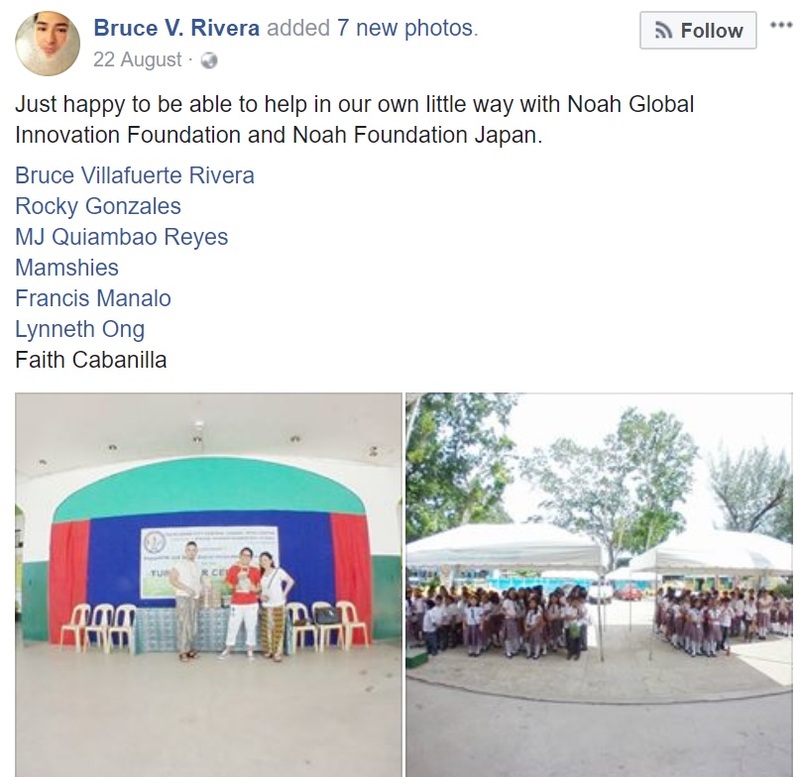 However, it appears to be a certain “Noah Global Innovation Foundation” or “Noah Foundation Japan”, judging from his post on 22 August 2017 [FB]. 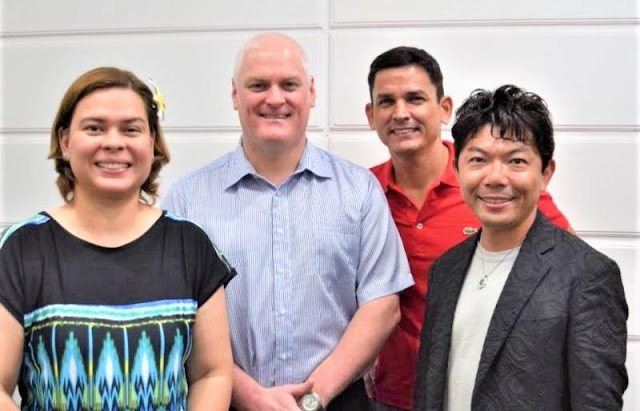 After a little more digging, I discovered that Rivera actually brought in August 2017 two Noah co-founders – Clarke Robertson and Martin Salvador – to Davao to meet Davao Mayor Inday Sara Duterte-Carpio. With Rivera, Robertson, and Salvador was Japanese National Izumi Tadashi. 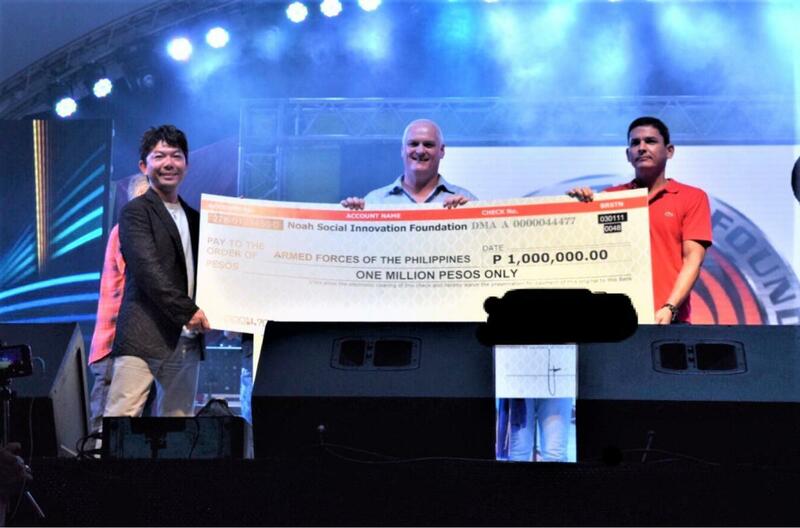 L to R: Davao Mayor Inday Sara Duterte-Carpio with Noah Foundation's Clarke Robertson, Martin Salvador, and Izumi Tadashi. Sources from Davao City Hall informed me that Rivera brought these three with him. To promote his illicit overseas business, it seems that Rivera used Duterte-Carpio without the latter being aware of it. 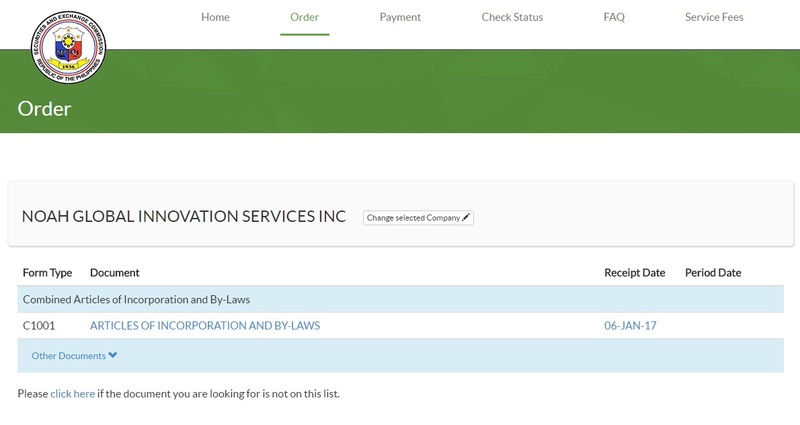 After all, who would think that a "foundation" would be a money remittance service? Tadashi and the gang even appeared at the DDS Global Thanksgiving Event held in August 2017 at the Crocodile Park in Davao City, donating P1-million to the Armed Forces. Sources informed me that the event was largely sponsored by Tadashi himself. Well, thanks! But at the cost of OFW who may lose hard-earned money to a pyramiding scheme? 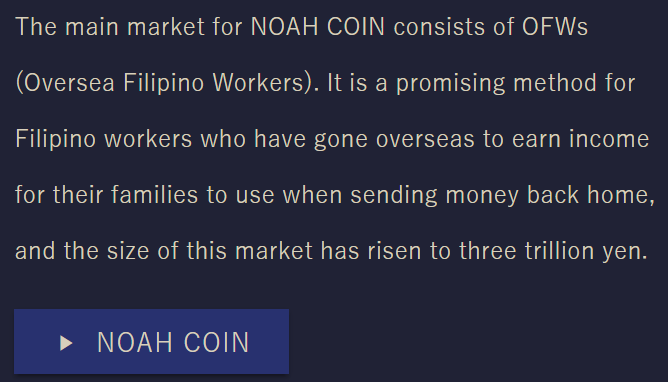 What we have here is Noah Coins, a cryptocurrency that offers itself as a cheap way for OFWs to remit money to the Philippines… but all signs point to a pyramiding scheme. It is unclear as to how many have bought Noah coins mainly because Noah’s payment portal does not issue receipts, i.e. it will be difficult to prove who paid what when. Noah Coins are issued by Izumi Tadashi brainchild Noah Foundation, with confirmed founders being Atty. Bruce Rivera, Clarke Robertson, and Martin Salvador. The Foundation also appears to be the financier behind the foreign trips of Rivera’s group that includes fellow bloggers MJ Quiambao Reyes and Rocky Gonzales. Noah’s administrators have a penchant for claiming association with big names in Philippine business and politics, presumably to help gain the trust of prospective clients. It has, however, been threatened with legal action after Lucio Tan’s PNB found out, and the Philippine Embassy in Tokyo has already advised OFWs to exercise caution in dealing with the organization. 1. 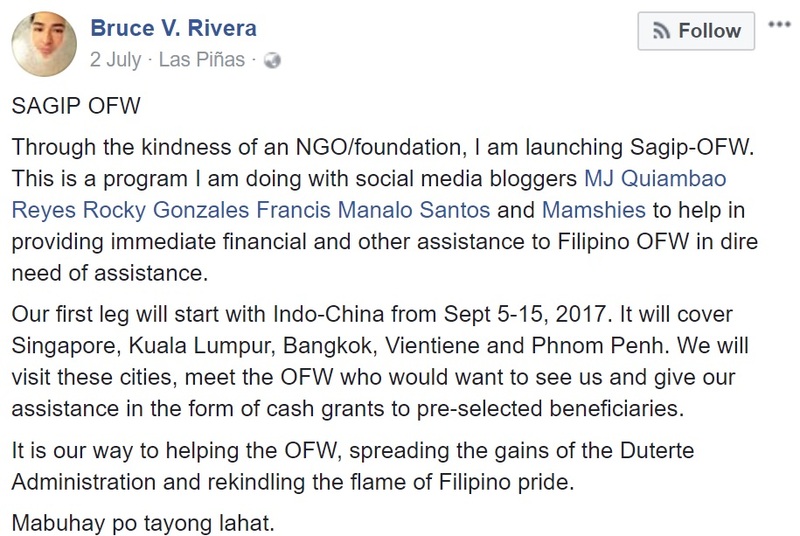 Financial literacy programs for OFWs and their dependents so they are likely to fall prey to these kinds of scams. 2. Tougher regulations for cryptocurrencies, because cryptocurrencies are largely unregulated today. 3. Tougher enforcement of laws relating to overseas remittance services, especially those that involve unstable or newly-introduced cryptocurrencies. 4. An SEC investigation with the option to pursue civil forfeiture proceedings against Noah’s founders, possibly to help OFW victims, if any. 5. An NBI investigation on everyone involved with the Noah Foundation, and filing of charges if needed.